Name of the city which, according to the Book of Judith, was besieged by Holofernes; the home of Judith. In the shorter version of the legend published by Gaster ("Proceedings of the Society of Biblical Archeology," 1894, xvi. 156 et seq. ), Jerusalem is the besieged city. 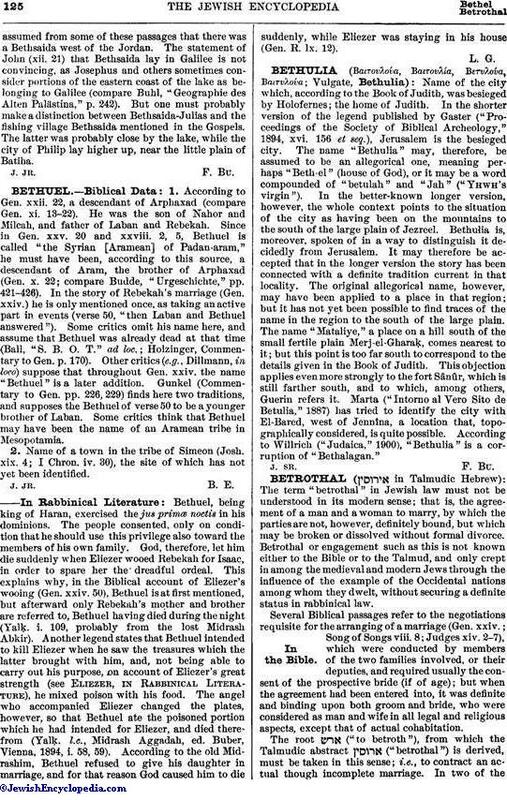 The name "Bethulia" may, therefore, be assumed to be an allegorical one, meaning perhaps "Beth-el" (house of God), or it may be a word compounded of "betulah" and "Jah" ("Yhwh's virgin"). In the better-known longer version, however, the whole context points to the situation of the city as having been on the mountains to the south of the large plain of Jezreel. Bethulia is, moreover, spoken of in a way to distinguish it decidedly from Jerusalem. It may therefore be accepted that in the longer version the story has been connected with a definite tradition current in that locality. The original allegorical name, however, may have been applied to a place in that region; but it has not yet been possible to find traces of the name in the region to the south of the large plain. The name "Mataliye," a place on a hill south of the small fertile plain Merj-el-Gharaḳ, comes nearest to it; but this point is too far south to correspond to the details given in the Book of Judith. This objection applies even more strongly to the fort Sânûr, which is still farther south, and to which, among others, Guerin refers it. Marta ("Intorno al Vero Sito de Betulia," 1887) has tried to identify the city with El-Bared, west of Jennîna, a location that, topographically considered, is quite possible. According to Willrich. ("Judaica," 1900), "Bethulia" is a corruption of "Bethalagan."